Enjoy a meal in the formal dining room which includes the original 1911 mahogany table and chairs. The 2 master bedrooms, with original double brass beds, and 2 compartments retain the original medicine cabinets, closets, sinks, ceiling and wall mounted light fixtures, and luggage racks. 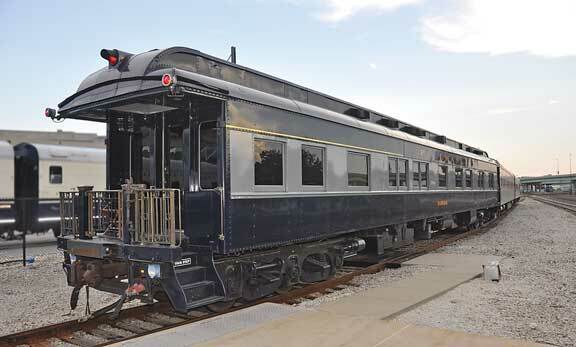 Other features include a large shower and changing room, crew quarters, full service kitchen, stereo CD/TV/VCR/DVD, original Pullman carpeting, observation lounge and open rear platform with original brass railings. Push-pull equipped. Based in the Tucson/Phoenix area. Built by the Pullman Company as one of the first all-steel business cars, Federal began service on February 3, 1911 and is the oldest private car certified for Amtrak operations. Presidents Taft and Wilson used the car for their travels from 1911 to 1916. Federal was sold to the DL&W RR in 1933. Acquired in 1992, Federal underwent extensive restoration and returned to operating service in October, 2002.